The Angriest: Doctor Who: "Inferno"
It is 6 February 1965, and time for another episode of Doctor Who. Barbara (Jacqueline Hill) races to escape Nero's court. Ian (William Russell) fights to escape the Roman Colosseum. The Doctor (William Hartnell) and Vicki (Maureen O'Brien) fight to avoid being murdered and to get back to the villa in the country. Nero fiddles. Rome burns. "The Romans" comes to its blazing conclusion in "Inferno", as the historical events of Rome's burning finally occur, and the four TARDIS occupants manage to make their way back to their villa before anybody notices anybody else was away. It's a successful return to the unusual blend of action, drama and comedy that made the first two episodes of the serial so good, with less of the English farce elements that dragged down the third. That it not to say the slightly more puerile humour is not there, but it is tempered with a lot of other material. 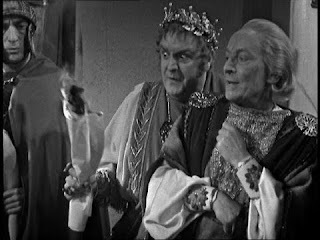 William Hartnell's Doctor makes a pretty strong comedic double act with Derek Francis' Nero. Here the Doctor inadvertently inspires Nero to burn Rome down, which is an unprecedented case of the Doctor actually contributing to a key moment in history. Previous episodes have seen him and his companions interact with the history but not actively contribute towards it. Even the Doctor himself seems shocked. The episode does an excellent job of freeing Ian and Barbara from their respective captivities, and returning them to the villa just before the Doctor and Vicki get back themselves. It ends very much how it started, with a relaxing tone and a warm, gentle humour. It really has been a remarkably distinctive storyline. Production-wise the episode does show its meagre budget a little too keenly, particularly in shots of Rome burning to the ground. It suffices for telling a story, but does stand out a little too much as being done 'on the cheap'. At the episode's end, the Doctor discovers an immense force is dragging the TARDIS down to an alien world. "The Web Planet" awaits. As for "Inferno", it's the third of four good episodes in "The Romans" - and the 14th good episode out of 15 so far in Series 2. The quality ratio holds steady at 93 per cent.